I am not familiar with desert flowers, but a version of this guy looking like a beaded evening bag with claws, hangs around these which bloom in early Spring here. Perhaps he is related to Iguana, which prefer red flowers for breakfast. I loved painting this. 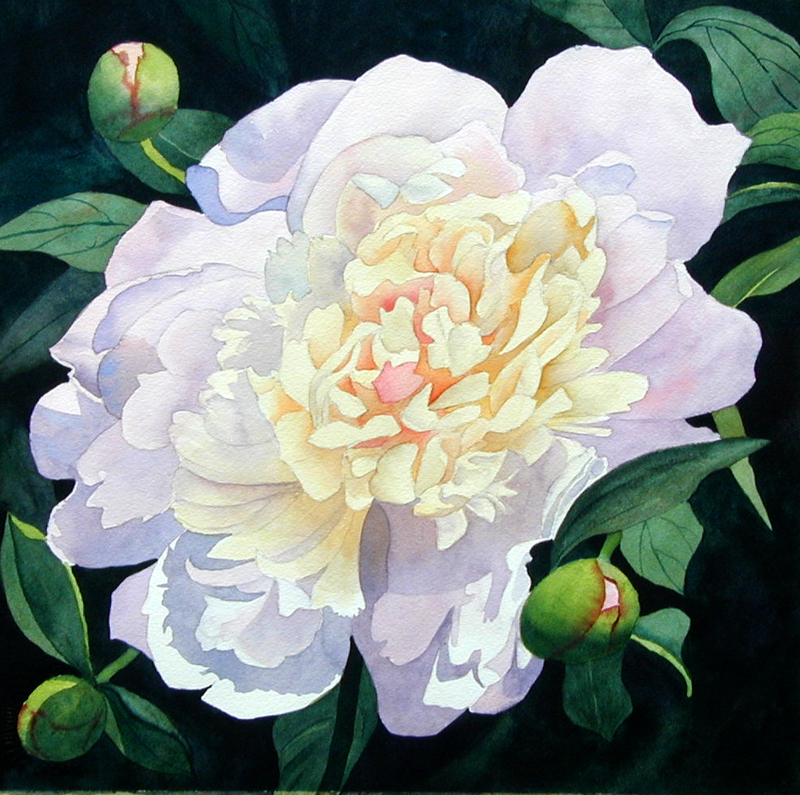 However, I had a prospective buyer before I ever thought it was finished, on the condition that I not touch it anymore. I still see things that I feel I ought to do but... the customer is always right! She wanted to bid on it, I put it up on ebay, she did, now she's been outbid! Sometimes maybe things are finished before we think that they are. Flowers in bloom during Springtime are visual poetry. I saw these beautiful flowers blooming in my garden, so I had to take a photo of them. Some inevitable changes, of course. With the generous matting, it is a rather large piece. There is a beautiful orchid show annually here and I always enjoy looking and taking photos. i This year, I decided to paint one of the lovelies. 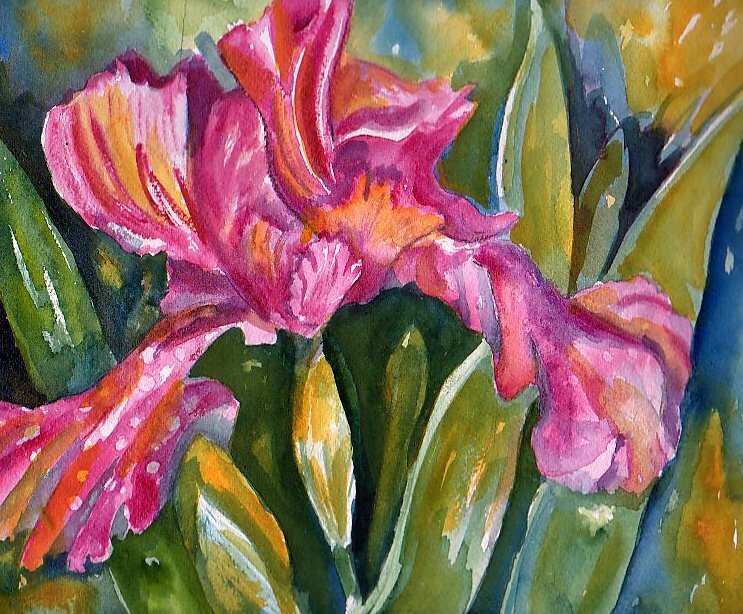 The soft pinks, warm yellows and the beautiful details of the orchid really drew me into painting one close up. Here is my painting for the month of May. 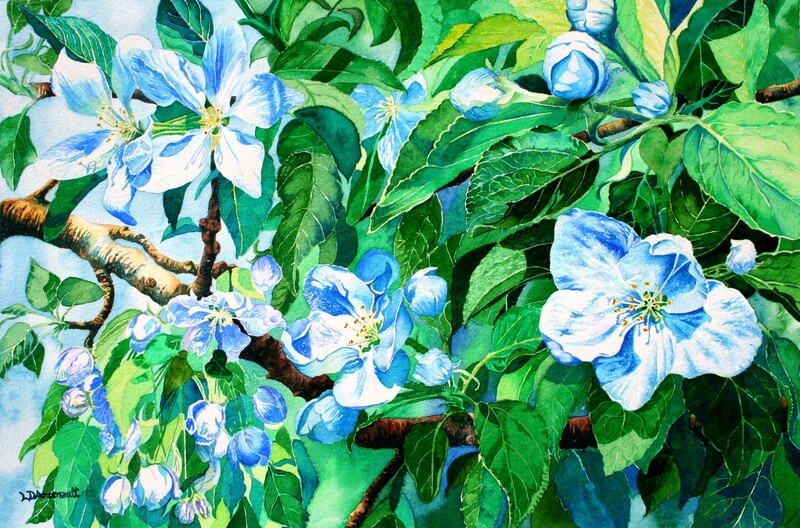 It is a painting of Tulip Tree Flowers that are so beautiful here in the spring. I especially like these colors. 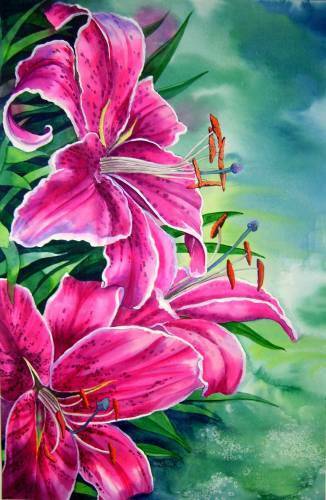 Flowers are one of my favorite subjects to paint. I have always loved them and examined them very closely since I was a little kid. In my Omaha neighborhood, I picked one from a yard once coming home from my piano lesson when I was about 9 or 10. The lady of the house it came from reported this to my mother by phone. I didn't even think about the fact that I was stealing that flower, but I never picked anybody's flowers from that day on unless I got permission from the owner. I am always awed at how many varieties of flowers there are and the wondrous colors they present. The first blossoms that appear in my garden are dandelions, a weed and aggrevating. At a closer look there is a lot of beauty in this plant and it is fascinating how it changes. 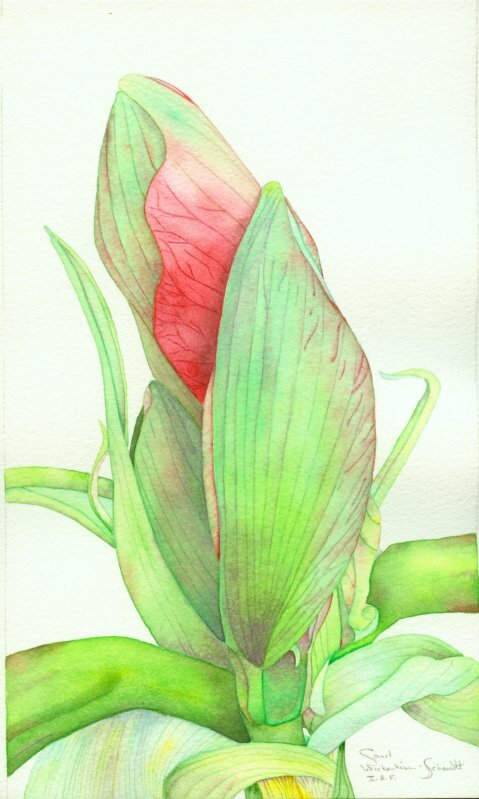 I tried a loose interpretation of this plant and to make the painting more interesting added some lines and writings. transparent watercolor on 140 lb Jack Richeson cold pressed watercolor paper. 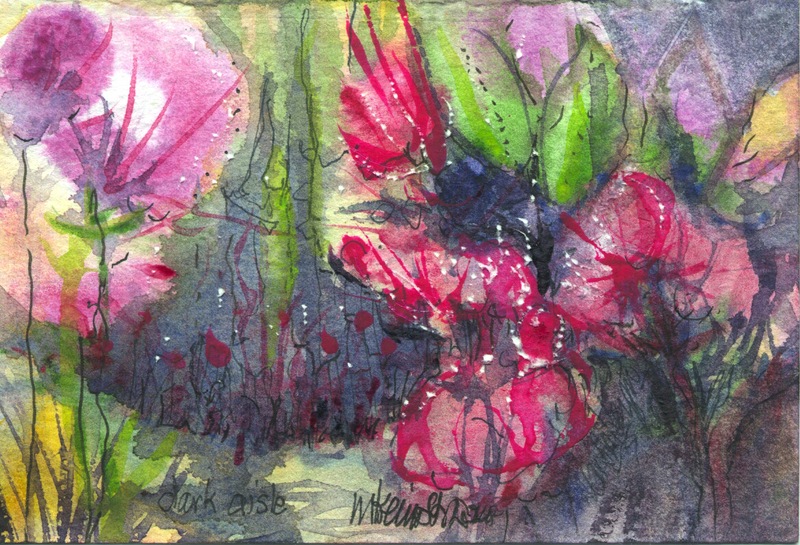 Painted for the REMP-ARTS 2009 Flowers & Nature exhibition currently on display in Langres, France. 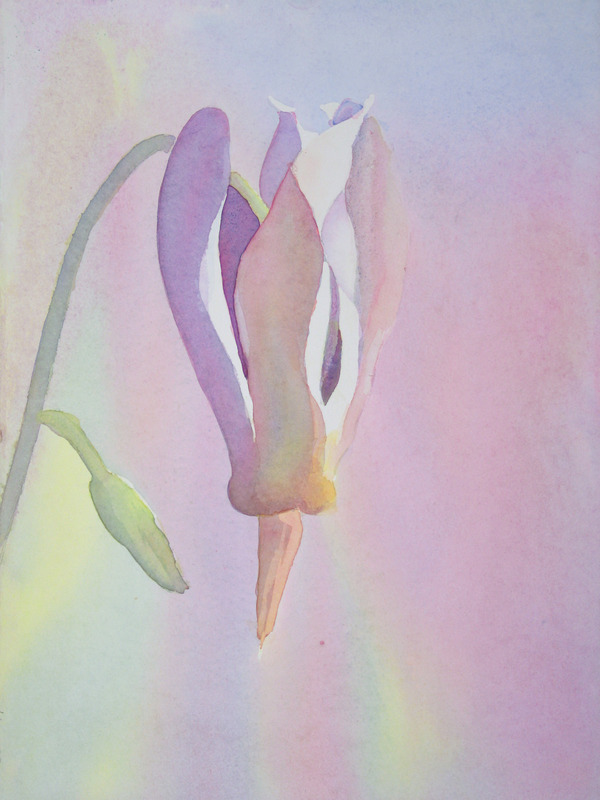 It was my intention to create unique viewing angles of flora. Thus, three Amaryllis buds, open blooms to the right and left have been cropped off. 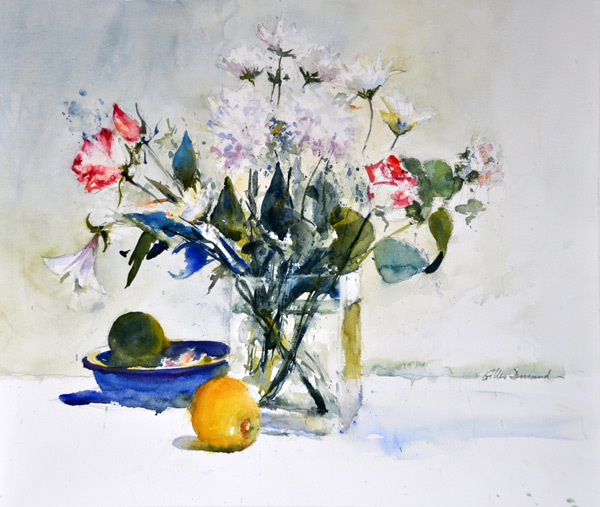 Transparent watercolor on 140lb Arches paper. The white is from the paper. I never use gouache in my paintings. This painting was submitted as an entry to a theme contest for the Mont St. Hilaire museum. All the paintings had to be about the color blue. 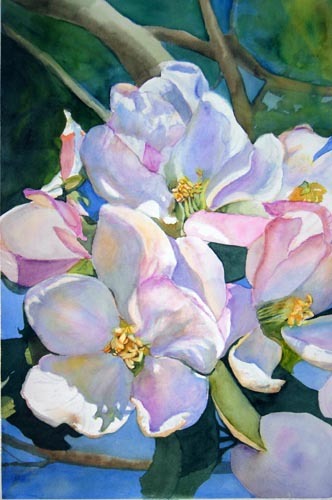 I decided to paint these apple blossoms that are so common to the region were I live. Even if I used my imagination to see them in blue (they are mostly white or pink) I also worked from digital photos that I tooked. The title of the piece came to me at the end. I was searching for an original title and then I tought of the apple and the garden of Eden. Voila! 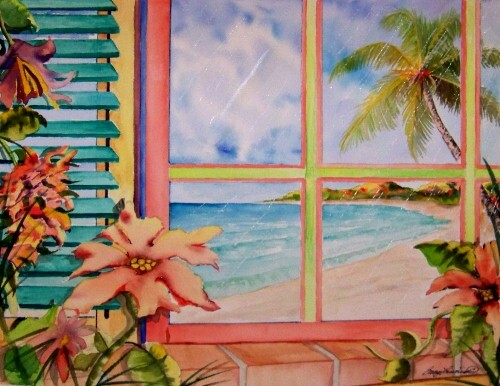 The inspiration for a "flowery" theme is from the time of year and I am in between trips to the Caribbean (my home away from home.) 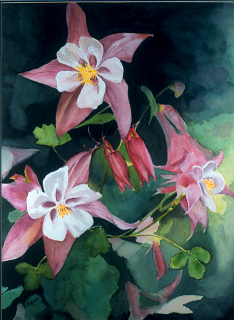 Having never been a "flowery" theme artist I enjoyed the challenge and have found I have so much more to learn. Recently I heard by some sports statistician that the main factor in true talent is the willingness to practice. This painting may very well prove that point. I have such a long way to go. Many years ago I got this amaryllis from my friend as a gift and this was a very first amaryllis I ever owned. In spring when flower was popping up I took pictures and thinking someday I'll paint this beautiful flower. Last year I finely painted, framed and hung it in our study room as a Christmas gift for myself. The shooting star is a wildflower native to Ohio, and I have a patch of them in my quarter-acre woods. 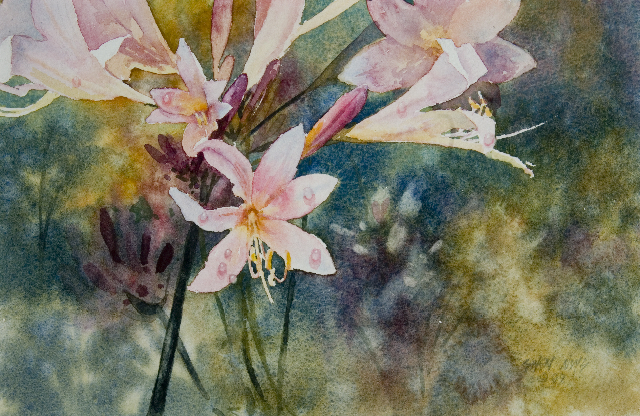 This one is from my photograph and is a demonstration of the pouring technique in watercolor. Down here in New Zealand, we are in the midst of our fall and winter is just around the corner! 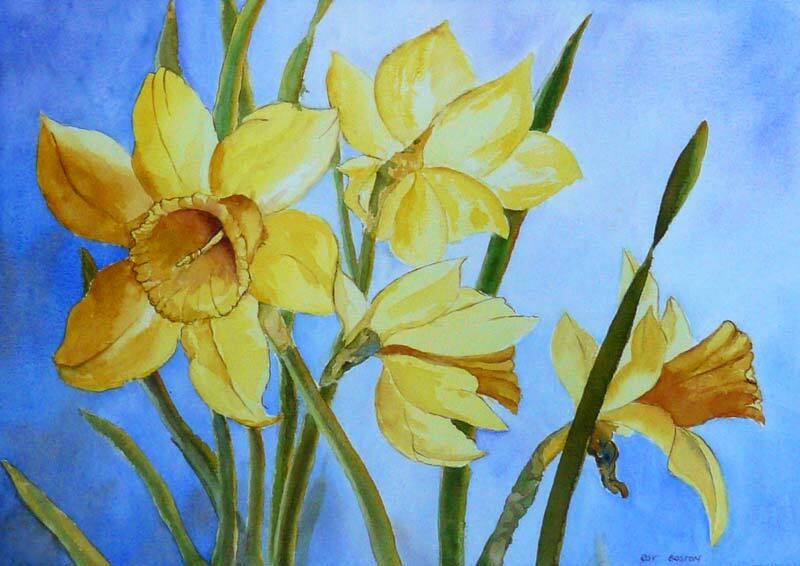 The daffodils, from my garden, were painted in our last spring and are a great reminder that winter (and the recession!) will not last forever. Not spring -- but a floral! Dogwood was painted from life, my preferred method. The dogwoods and lilacs are in full bloom in my yard. My neighbor has a pink dogwood and I once begged for a branch but didn't ask this year. The painting is a half sheet of Arches 140lb cold press. I sometimes use 300lb for full sheet paintings but prefer the lighter paper as it does not absorb as much paint. My palette has Cobalt, French Ultramarine, and Pthalo Blue, Windsor Red and Permanent Rose, Cad Yellow Light, New Gamboge, and Burnt Sienna. 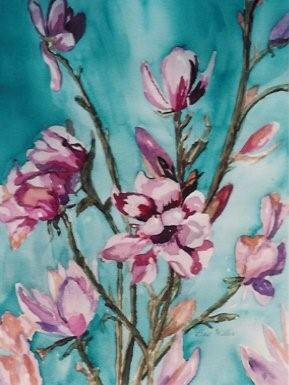 Start with blossoms and add lighter greens to each section while flowers are still wet. Greens are all mixed and darker greens added later. Background added last. Prefer pale backgrounds that will blend with the foliage and flowers so I don't have to too careful painting around flower shapes. I used a small mason jar as model for container, making it look like larger glass vase. 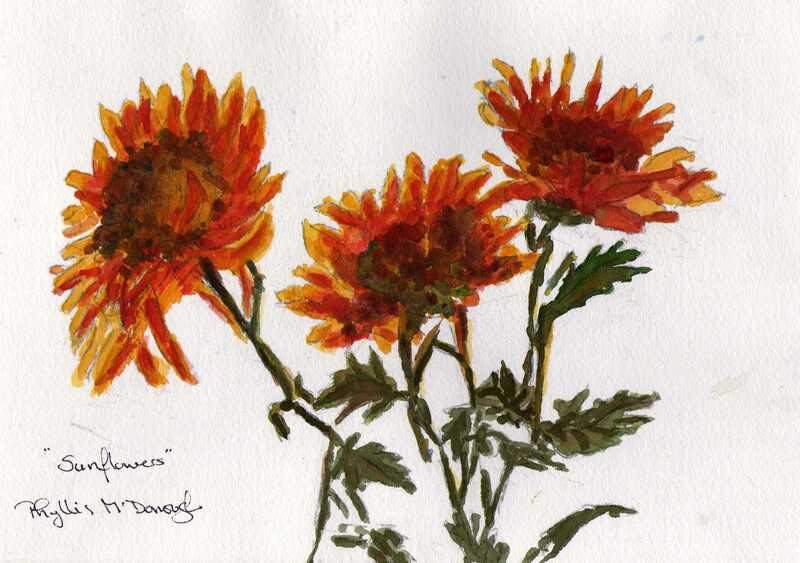 Not spring flowers but wild sunflowers as I like their unruly look. 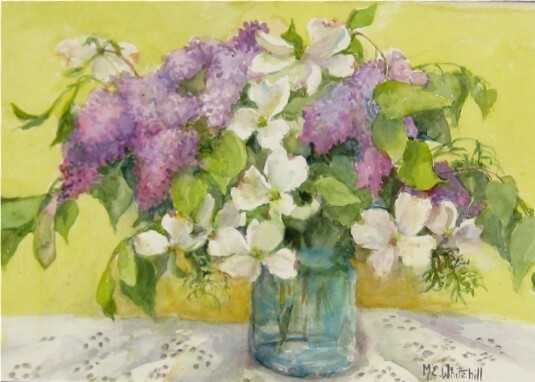 Lilacs are my favorite spring flower because they bring with them not only their beautiful flowers but also their delicious aroma that is a pure delight after the long winter. Daniel Smith colors on 300lb. Arches paper. 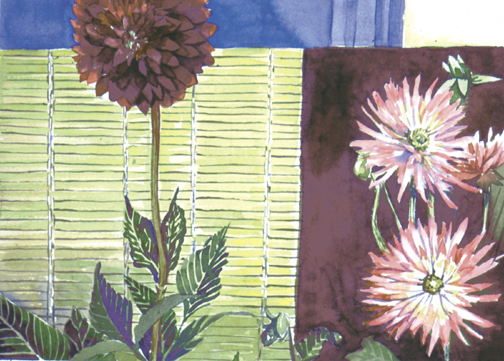 I used these dahlias from a friend's garden to illustrate the compositional possibility of asymmetrical design with balance through color choice. I wanted to show how lights could advance against a dark background and how a warm could in fact become a viable background using the concepts of overlap and shape. The two integrate through the leaves in the foreground. I always like playing with compositional ideas around color theory. Dahlias are such a hearty flower and seem to be ubiquitous in Vermont come July, which for us can often seem like the middle of spring, since the I was just skiing here on April 18, 2009! 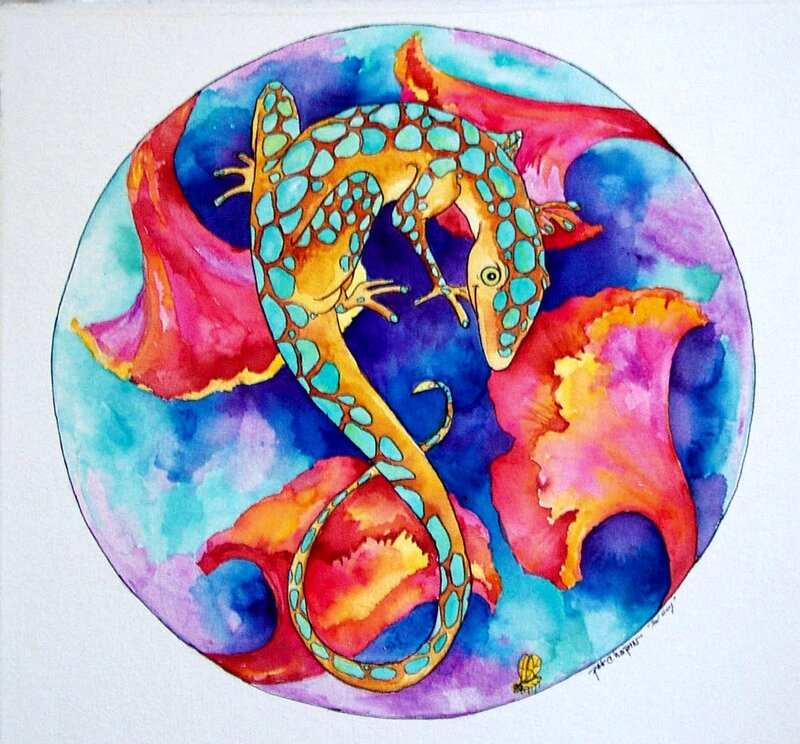 This one is a combination of traditional watercolor and watercolor pencil. 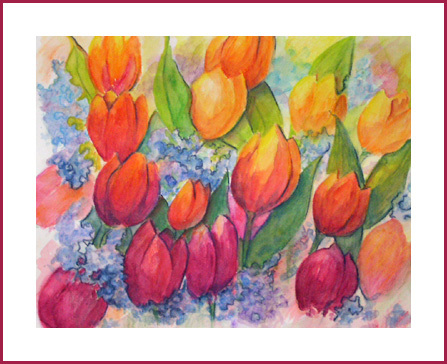 I think tulips are one of the first beautiful flowers of spring so this one really appealed to me. I tried to capture the sunlight hitting the tops of the upper tulips and get that feeling of a beautiful spring morning. 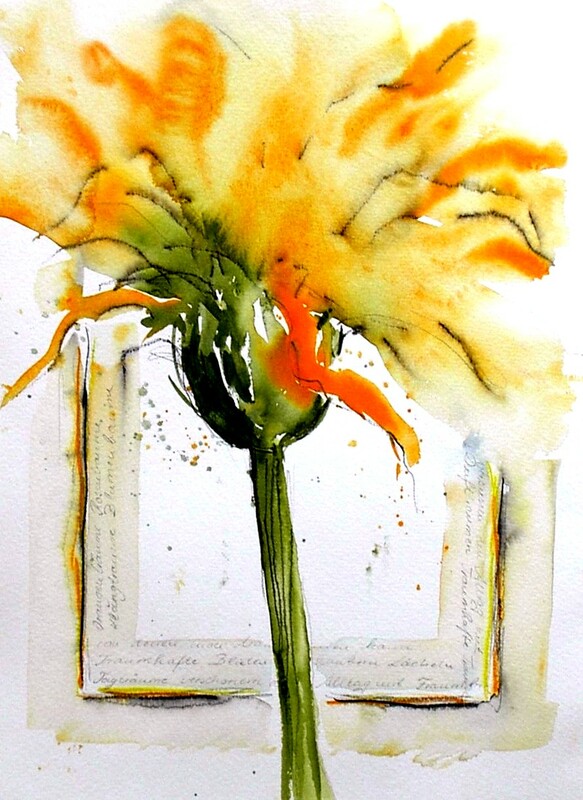 "Bouquet, citron et citron vert"
Tulips from my garden, a special painting for a friend. 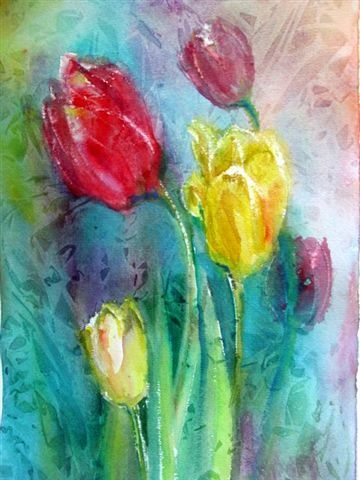 This was an enjoyable experiment using crushed saran wrap onto a colorful background with the colors of the tulips portrayed within. May is a sight for sore eyes in Istanbul. First lilacs blossom, then Bosphorus turns purplish pink with Judas trees in the fresh green of the hills and wisterias compete with all of them climbing up houses/pine trees, doing everything to make themselves visible. 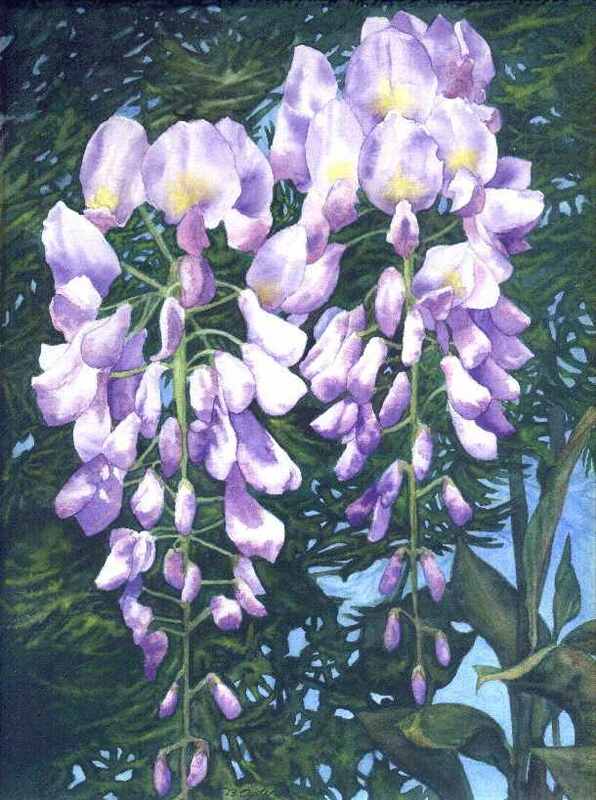 This one is also climbing another tree, it is painted on 9x12" Arches paper,with Schmincke purples. I love their purples.